With the upcoming installation of a GIW Minerals® TBC-92 pump, GIW Industries Inc. will officially have hydrotransport pumps in service at all operating Canadian oil sands mines. This landmark project is taking place at the site of a customer who has been with GIW since 2009. 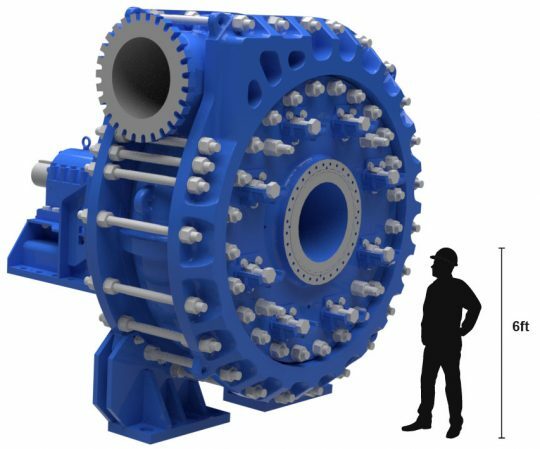 The customer was familiar with the success of a TBC-84 pump at another oil sands mine and was interested in replicating its impressive 6,000 hours of wear life. However, this particular application and its hydrotransport requirements posed a few unique challenges that made a larger, more aggressive pump appealing. That product is the GIW Minerals® TBC-92 High-Pressure Pump. Once it is installed, it will be the largest slurry pump operating in the oil sands. Although GIW has worked closely with this customer for nearly a decade, the customer considered all options before deciding on the TBC-92. The customer’s process conditions are very similar to those of another GIW customer in Chile. The GIW team showed the customer a real-life example of their reliability and success in South America’s most demanding pumping conditions. Choosing the TBC-92 would provide significant short-term savings for the customer. Just one of these massive pumps could achieve the flow rate they need. The TBC-92 would also mean long-term savings through longer run times, fewer maintenance outages, and increased production. Ultimately, the TBC-92’s track record, lower total cost of ownership, and the customer’s trust in GIW’s service beat out the competition. The GIW team is working alongside the customer to perfect the development, installation, and long-term operation of the oil sands industry’s first TBC-92 pump. Not only is the TBC-92 making its debut appearance in the oil sands but its installation also signifies an exciting development for GIW in this region. With the introduction of this pump, GIW will be the only slurry pump vendor to have hydrotransport pumps at all operating oil sands mines. This speaks as much to the industry’s trust in GIW’s high-quality equipment as it does to our dependable customer service.